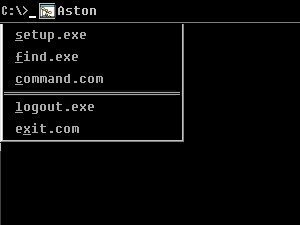 This Here is the 'retro' theme - for all those who are nostalgic about the good ol' days of DOS 6.22 and previous... Colour scheme & icons are based on Windows 3.11 just to complete the picture. This is so awesome, i am definately going to use this theme on my computer. I think it's a great theme which accomplishes everything (I perceive) that it was designed to. I love the puny amount of sytem resources it uses, which leaves plenty for my hoggy apps. Aston is def cool for that too! I bought Aston for myself yesterday, and I'm buying it for my sister tonight! I think it's a great theme which accomplishes everything (I perceive) that it was designed to. I love the puny amount of sytem resources it uses, which leaves plenty for my hoggy apps. I hope that Tim McColough reads this. it looks really cool if you lock the taskbar and turn off beveling in aston master. This is a great skin, everyone makes these rediculous bubbly, complicated, animalistic looking skins. If I am not mistaken, isn't that what people DON'T like about the default winXP shell? Why recreate it? Its all about the retro style!!! Nice theme. I was surpriced to see this type of theme. Very functional. Because those who do not know their past are doomed to repeat it, and would you REALLY want to go through the DOS ages again? Okay, that made no sense whatsoever, and for that I apoloize. No, to answer your question, ash, because it is phun. It is history. DOS and win 3.1 REVOLUTIONIZED computing, it is the FOUNDATION that allows you to use aston, the foundation that allowed win 3.1 to mature through 95,98/SE,2000,ME,XP, and to reflect on this past allows for us to think back to our roots and marvel at how far we have come. Skins like this keep the spirit of the past alive. That and it is just wicked cool. lol. Cheers.